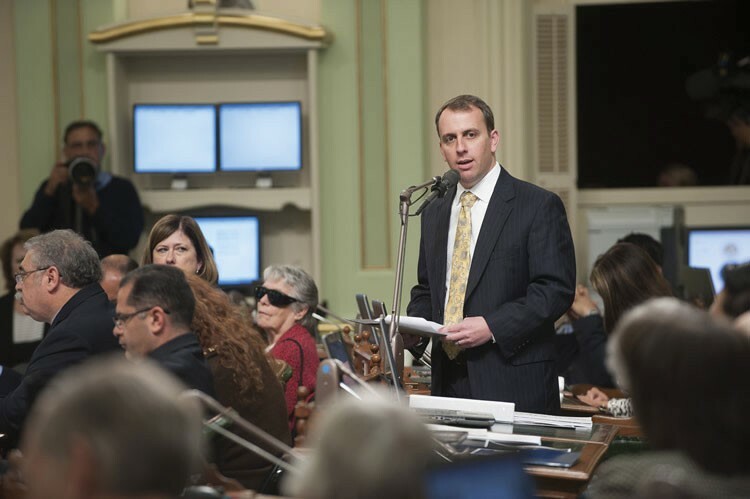 OUR MAN IN SACRAMENTO Is Assemblyman Marc Levine progressive enough for the North Bay? Assemblyman Marc Levine sailed to an easy primary victory last week, earning what will almost certainly be a second term in the Sacramento statehouse. He'll square off in November against Republican challenger Gregory Allen. But Levine, who represents Marin and parts of Sonoma County, has peeved area progressives since he was first elected in 2012 after serving as a San Rafael city councilman. In almost any other part of the country than hyper-liberal Marin and Sonoma, Levine's positions on many issues would make him the most progressive pol on the block. Yet detractors say he's a prime example of a politician with excessive fealty to anti-environmental interests, a charge that stems in part from a vote he abstained from that would have granted the California Coastal Commission the right to levy fines on eco-violators without a court order. He had originally supported the bill. Pulitzer Prize–winning journalist Gary Cohn argued in a well-traveled piece on capitalandmain.com that Levine embodies the California "corporate Democrat." Veteran progressive activist and media critic Norman Solomon, an occasional contributor to these pages who ran for Congress in 2012, says Levine is cut from the same cloth that elevated Jerry Brown to the governorship. Solomon, who lives in Inverness and supported Diana Conti over Levine this year, says that "the Jerry Brown situation is part of a pattern that is replicated by Marc Levine. It's seen as a winning approach—talk progressive and govern corporate centrist." Leo Wallach, a political consultant for Levine, roundly disagrees with the "corporate Democrat" tag and says the report was a "cooked-up hit piece on Marc." "I don't think Marc likes labels," he says, "but the accurate label would be 'progressive independent Democrat.'" Wallach says that label inspires some voters while making others nervous about Levine's principles. "He didn't take the interest-group path to Sacramento," Wallach says. "He has progressive values and an independent approach." You might say the same of Brown, who also cruised to a primary victory last week and will face moderate Republican Neel Kashkari in November. But in one critical way it is difficult to equate Levine as a sort of Mini Moonbeam beholden to corporate interests: Big Oil is the state's largest and most powerful special-interest lobby. A recent California Common Cause study of the lobby's influence found the oil and gas lobby, led by the Western States Petroleum Association, had spent nearly $15 million in 2013–14. Levine has accepted zero dollars from the gas and oil lobby. By contrast, Brown has taken more than $2 million from the industry in recent years. The "corporate Democrat" tag represents a curious evolution of descriptors, when you consider that a similar "new Democrat" designation was applied to Bill Clinton in 1992, when none other than Jerry Brown was seen as the great progressive antidote to Clinton-style centrism. Brown's campaign that year was a model of pre-big money politics; he vowed to accept individual donations of no more than $100, and roared into the Democratic convention with hundreds of delegates in his camp. Now the local media has taken to calling Levine a "new-style Democrat," who has accepted contributions from various real estate interests, the California Chamber of Commerce and a hedge-funder or two. But he has offered legislation that flies in the face of the "corporate Democrat" charge, says Wallach. The first bill Levine offered this session would have banned plastic shopping bags in big retailers. Opposed by the chamber, it petered out in the Assembly and Levine sent it to the "inactive file." Levine also played into the hands of the tax-and-spend-liberal crowd when he pushed a bill that would double fees on automobile registration to support fingerprint identification programs. It passed. Critics of Levine point to his vote last year on a bill that set the stage for an expansion of fracking in the state. Levine had previously offered a bill of his own that would have put a moratorium on the practice, and says he still supports a moratorium. This year, the Press Democrat reported that a pro-fracking supporter paid for anti-fracking materials on his behalf, raising the ire of local progressives. To opponents, the Coastal Commission non-vote was faux-progressivism of the worst sort. Yet Wallach says it signaled Levine's deep-dive into the details of the bill, which, Wallach says, would have "created some bad incentives and unintended consequences" had it passed. Wallach insists that Levine supported the principle driving the bill. "Some of these things are very technical, and it's very important to have a legislator who is willing to look past the title of a bill." But the anti-Levine forces are not assuaged. U.S. Congressman Jared Huffman was one of numerous statewide Democrats to endorse him this year, a move Solomon calls "unconscionable." "Progressive independent Democrat" or company man? If reelected, Levine's next term will be revealing.